The SFEMS-CJC series continues on Sunday, February 18, with Ensemble Bizarria looking at the complexities and vulnerabilities of one of our greatest and most beloved musical icons. Lindsey Strand-Polyak, violin; Evan Hesketh, viola; and Alexa Haynes-Pilon, cello; with Eric J. Wang, reader, offer a different portrait of Mozart through his own words and music. Mozart’s six-movement Divertimento for String Trio in E-Flat Major was written in September 1788 and first performed in Dresden the following April on the composer’s multi-staged journey from Vienna to Berlin. A rare jewel of a piece that elevates the divertimento genre from pleasant cocktail party music to an exploration of the composer’s complexities, it demonstrates the extraordinary style and emotional depth found in the composer’s celebrated string quartets. With the more vulnerable and open texture of a single violin, viola and cello Mozart creates drama, richness and extreme intensity that mirrors the very real challenges which were unfolding in his life at the time. To tell this story Ensemble Bizarria—known for its offbeat and unusual programming—will complement the performance of the Divertimento with dramatic readings from Mozart’s own letters from the same period, curated by 18th-century scholar Dr. Eric J. Wang. 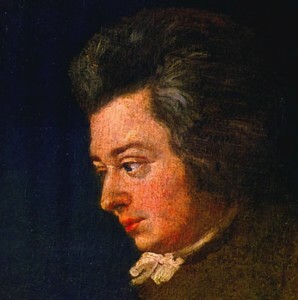 Of particular interest are pleading letters to his Masonic brother and friend, Michael Puchberg (to whom the Divertimento was dedicated in repayment), when Mozart was compelled to beg for money to pay off heavy gambling debts. Other dramatic readings will focus on professional life, relationships with colleagues, and friends and family. 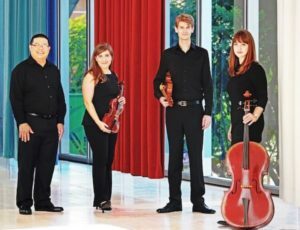 Los Angeles-based Ensemble Bizarria was founded by Lindsey Strand-Polyak (violin),Alexa Haynes-Pilon (cello) and Eric J. Wang (harpsichord) in 2016 and does Baroque just a bit differently. We aim to shake off the powdered wigs of the 17th and 18th Centuries, reclaim some of music’s wild past and connect it to our equally wild present. Recent appearances include the Twin Cities Early Music Festival in 2016 and the 2017 Boston Early Music Fringe Festival. Ensemble Bizarria is the only early music group to have been selected as a recommended artist in the 2017 Beverley Hills National Auditions. Its members play with ensembles such as the American Bach Soloists, Musica Angelica, Pacific MusicWorks and Ars Lyrica Houston. Dr. Strand-Polyak and Dr. Haynes-Pilon are the Artistic Directors of the newly formed Los Angeles Baroque. The CJC offers a casual and intimate environment where the audience can enjoy a light meal and sip a glass of wine or a cup of coffee while enjoying the concert. The concert starts at 4:30 pm at the California Jazz Conservatory, 2087 Addison Street, Berkeley. Tickets are $20 (general admission) and go on sale for each concert approximately one month in advance.